This skagen recipe is inspired by a popular dish in Sweden called ‘skagen’. It can be made with prawns or shrimps but they should be precooked before they added to the mix. Put potatoes in oven for 60 minutes at 200°C and turn at 30 minutes. Once the potatoes are cooked, score them lengthwise and cross wise. Place your fingers on opposite ends of the potato, gently push in and up until potato opens up slightly. 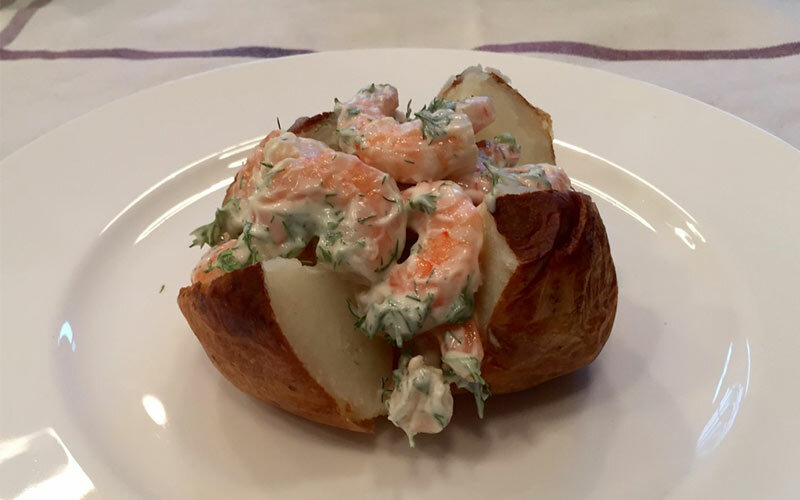 Add a dollop of butter and spoon the dill prawn mix into the centre of the potato. Want to know more about how eating can aggravate your IBS? Read here.